For more than a decade we've been looking for an RV travel guide that gives us the information we most need. We're frugal minded RVers. We've searched but, so far, have never found a guide book that's written expressly to help us save money on our travels. For example, we know that many free camping options exist because we've found them. But where's the RV travel guide that tells us exactly where these are located? For 18 years we've been doing both. RVers are generous with sharing information but directions to their favorite free camping areas - the ones that are almost too good to be true, that perhaps hold only two, three, or four RVs - are often kept close to the vest for fear that the next time they visit, their favorite spot will be occupied. In fact, there are a few such spots that even I can't divulge to you because we've been sworn to secrecy by those who told us about them. But, through 18 years of shunpiking (driving the back roads), we've come across many more of these jewels on our own. We've Found Hundreds Of Free Campsites. For that reason and, in response to questions from our friends and relatives who wonder how we can afford to travel as often, as far, and for as long as we do, I've written a series of RV travel guide e-books that I've called The Frugal Shunpiker's Guides. In fact, over the twelve years we've been traveling, we've accumulated so much information that I've decided to break it into separate e-book guides for each area (kind of like the Fodor's of budget RV travel). It's frustrating to me that just when we, the baby boomers, are beginning our retirement or semi-retirement, the cost of travel is going up like crazy due to the so-called oil crisis. I believe that everyone can afford to travel if they do it the way we do. 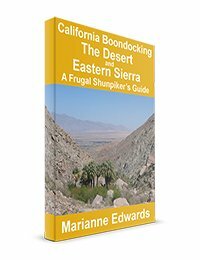 So, I've made my Frugal Shunpiker's Guides available to everyone whose dream of adventure travel includes hitting the road and leaving it all behind. 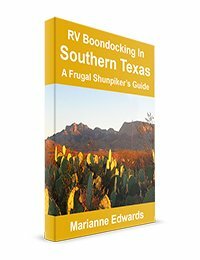 The first five e-book RV travel guides in the series are now available for you to download immediately. These guides are not just for RVers. Most of the suggested frugal and "camp-for-free" areas listed in the guides are suitable for tents as well as RVs. 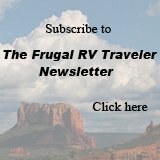 Where Are The Free RV Dump Stations? How annoying is it to pay $5.00 or even $10.00 to dump your RV tanks, only to find that the next day you stop at a visitor center or gas station that offers this service for free? If you had only known, you could have held off one more day. In our 18 years of RV travel, we've gathered and documented all kinds of useful information and tips to help you save money on groceries, dining, entertainment, entry fees, Internet, laundry, and dumping your tanks, without detracting from the enjoyment or your travels. Although we visit some cities, our RV trips tend to be geared toward the natural wonders. Following the routes suggested in each RV travel guide, you'll be on the move rather than planted in one place. You'll experience a variety of wonderful scenic locations and even benefit from our reviews of the best hiking trails. I Pull a 35' Fifth Wheel. Will it Fit in these Free Campsites? I get this question a lot so I've answered it here on my FAQ page. There's plenty of that in each RV travel guide too! If free campsites exist but the road to them is particularly bad or the campsites aren't level enough for an RV, we'll let you know and usually have an alternative suggestion. If we've spent our money on an attraction that we didn't feel met our expectations, we'll tell you about it. And, if it is bound to cost more in fuel to drive to the free camping area than using the nearest pay campground, then it's not really free is it? So, unless it's a particularly scenic site and well worth the trip, we won't even mention it. We've spent our time and gas to check out the conditions so you won't have to. Speaking of honesty, I don't expect you to just take my word for it. What I really enjoyed is how Marianne separates each state into sections making it easy to concentrate on a specific route you want to follow, or a specific area of the state you intend to visit. 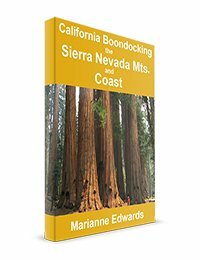 Within each section she goes into great detail on what that area of the state has to offer; from what time of year it is best to visit the area to State & National Parks, monuments, attractions, facts, fees, wildlife, free camping, hiking, information on the local communities and so much more. 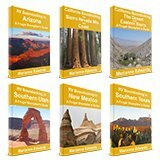 These books are well organized in an easy to read manner and the photographs highlighting some of the attractions make you want to load up the RV and hit the road right now. If you are planning to visit any region of any state Marianne has written about don't leave home without the e-book. It is a valuable guide to getting the most out of your trip while saving the most too. Whether you camp in a tent, dry camp in an RV, or camp with all of the amenities, these e-books offer something for everyone. Following the Frugal Shunpiker's RV Travel Guide you'll experience your entire trip differently. In many places the campgrounds all look the same but imagine sitting out with your chair facing the scenic view instead of the neighbor's camper. Using my RV travel guide you can relax and enjoy your day of travel and exploring, knowing there are camping options nearby and where to find them. Do you hate having to make campsite reservations? Making reservations prevents you from 'blowing with the wind' and traveling at your own leisurely pace. Yet, if you're on the road at peak season and don't reserve, you risk that the campgrounds near your destination will be full. 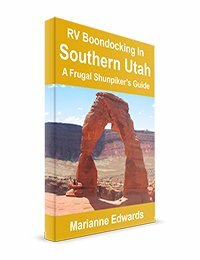 You'll be pleased to know that each Frugal Shunpiker's RV Travel Guide includes directions to many free camping areas that we've discovered near most of the major National Parks in the American Southwest. I'm willing to bet that you won't go back to the park's pay-campground after experiencing our suggested free campsites. Even if you already consider yourself a shunpiker and enjoy driving the back roads to look for unadvertised campsites, you'll want this RV travel guide to supplement your own finds. Although we enjoy the search, we also know what a gift it is when others direct us to their favorite (secret) free camping locations. Also, of course, there will be updates. Since we plan to travel again in the coming years, any new discoveries and free camping locations will be added to the existing books. By purchasing an e-book now, you'll automatically receive all future updates of that RV travel guide free of charge. Important: On the purchase page, you'll need to confirm you want to receive update emails, or I won't be able to send them. I promise I won't send you any other mail - only the updates for the guides you purchased. 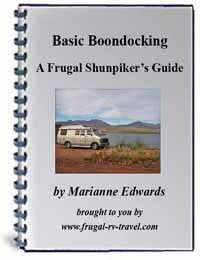 "Basic Boondocking - A Frugal Shunpiker's Guide"
This is the RV travel guide that answers the question we are asked most often: "How do you do it? How do you manage to get away so often and for so long on your (limited) income?" It also answers many other questions such as: "How can you live in such a small space without killing each other? Why do you prefer boondocking? Is it safe? How can you trust such an old vehicle? How do you find all these places to camp for free? How do you shower? Why don't you drive one of those bigger RVs? Why don't you use hookups?" This 23-page printable e-book answers all those questions and explains the basics of boondocking - the way we do it. Pay securely using Paypal or your credit card. You Do Not Need a Paypal Account. But, if you do use it, your payment will be processed through Paypal, your refund is 100% guaranteed by them as well as by me for 60 days. If you are not completely and 100% satisfied with your purchase of any Frugal Shunpiker's Guide, simply send me a message through the Contact Us page of this web site within 60 days of your purchase and your money will be cheerfully refunded. No questions asked. So your risk is zero. To see pictures we took at some of our free campsites, a list of each book's contents, and testimonials - click on the image or the "details link" for each guide below. Take advantage of the introductory offer price of U.S. $27.00 $17.00, knowing that you're protected by my 100% 'no questions asked' money back guarantee. That's less than the average cost of one night at a campground! Once your order is processed through our secure online form, you'll get immediate access to your product(s) as well as the bonus e-book: Basic Boondocking. But wait....you don't have to pay full price for each e-book! No coupon code required - the shopping cart will automatically calculate the discount for you. 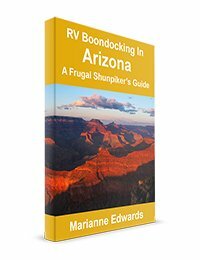 Purchase the Frugal Shunpiker's RV Boondocking Guides and visit each state's most popular destinations while saving hundreds of dollars in camping fees. 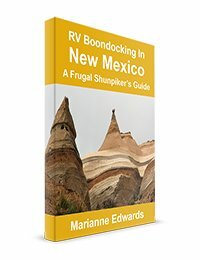 Frugal Shunpiker's RV Travel Guides are only available as e-books. Want to know more about ebooks? To have all the information at your fingertips anywhere (even in the middle of nowhere without an Internet connection) you can put the guides on your smart phone or tablet. NOTE: The electronic file is sent to you via a separate email from e-junkie (my secure online file manager) to be downloaded immediately after purchase and is delivered in PDF format. You will require a PDF reader - we recommend Foxit Reader or Adobe Acrobat Reader - both are free downloads. You'll be able to read your e-book on your computer or print it for reading later. You can also save this instant download to any device you own or onto a USB thumb drive (memory stick) or disc and take it to a print shop to have it printed (and spiral bound). It is a copyright violation to share these files with anyone other than the purchaser. please use the shopping cart provided under each e-book title above. P.S. These scenic free camping options may not exist forever. Take advantage of them now! Even if you use each RV travel guide only to find one night's free camping, your savings will be more than the purchase price.